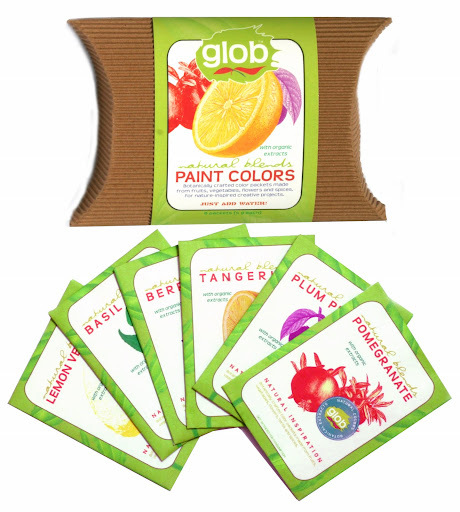 Glob Botanical Paints' Natural Color Blends are unlike any other art tool we've ever used in that they are crafted from botanical pigments and plant extracts: fruits, vegetables, flowers and spices. Each water soluble color blend comes in powder form in individual packets, and you add water to turn the powder into 1-2 ounces of paint. Six bright and cheery colors are included in the collection: lemon verbena, tangerine, pomegranate, plum purple, berry blue, and basil green -- and I thought it was very cool and primal to paint with nature's elements to achieve color. Eco aspects: Natural Color Blends are made in the USA. They are non-toxic, gluten-free, soy-free and vegan, and they feature biodegradable packaging. I also really like that GLOB is a small company founded by a female artist, Ashley, when she set out to create a line of truly non-toxic paints that were completely free of chemical irritants. While I really love the idea behind Glob's Natural Color Blends, I experienced some difficulty when it came to mixing the powdered pigments with water to achieve the desired, paint-like consistency. Even though I followed the instructions, our paints were either way to thick or too runny, and I ended up not being able to use a couple of the paint mixtures I made because they ended up with the consistency of water. I think I'd prefer the convenience of Glob's easy shake jars, which you fill with water and shake to blend. That said, the colors of the paints we did get right (it can be done) were indeed vibrant and beautiful, as you can see on Olivia's painting below. And it was fun explaining to her that each hue came from an element in nature. You can also check out more masterpieces created with Glob paints here on their Facebook page. great article beth. The natural way is the method that Indian Rugs were weaved.They took the wool and then dipped it in red beet juice or a green dye from a plant etc and then did the weaving after drying it. So interesting. Glad to see you wrote this up, now I can refer people to it. Still considering getting some to try out. The little one looks adorable with her painting!